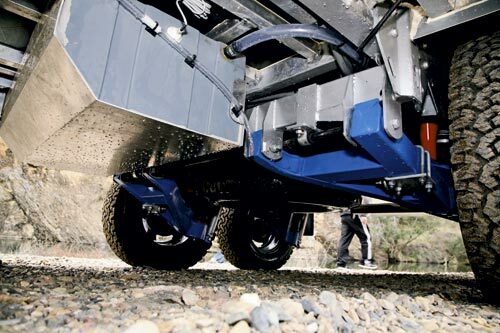 The Kruiser’s chassis has hot-dipped galvanised steel and comes with independent suspension for the tandem axles. The suspension has 4000kg trailing arms, airbags and shock absorbers. Depending on the mode of travel (on-road or offroad), the airbags can be raised or lowered as needed. The wheels and tyres can be fitted to the buyer’s choice but they all come with electronically-operated disc brakes. Although disc brakes on caravans are a new concept, they have been designed to cope with rough road travel. 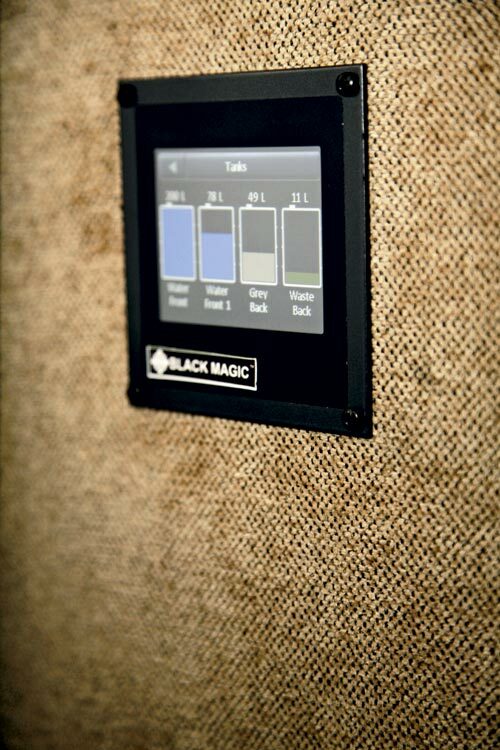 There are no cables or handles for the parking brake – it’s just a simple one touch operation to turn it on or off! The Kruiser’s walls and roof are built in alloy Trellis Tube, designed for strength and light weight. Smooth fibreglass is used for the exterior, including the one-piece roof section. The tropical roof is a real feature of this van. It consists of a second layer of the same material as the roof with a 50mm air gap in between, and it works surprisingly well in keeping the internal temperature down. 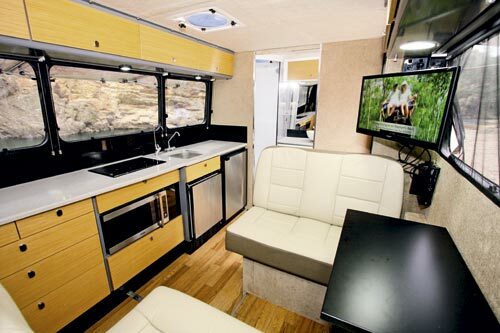 A feature is the Kruiser’s second (external) kitchen. 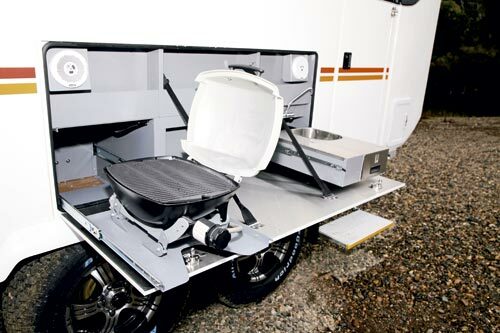 It looks like an oversized picnic table but it has a small slide-out stainless steel sink and slide-out Weber barbecue, as well as the other kitchen necessities. The Kruiser T3’s layout is, to a certain degree, pretty conventional, with a front bedroom, full-width rear bathroom, offside kitchen bench and mid-nearside dinette. Instead of a normal cafe-style dinette, the two leather-upholstered rear-facing seats have individual (car style) adjustable seat backs with head rests. The forward-facing lounge seat will fit two people comfortably and there is a tri-fold table between front and rear seats. Across the way, the large kitchen bench has a conventional microwave below the bench. 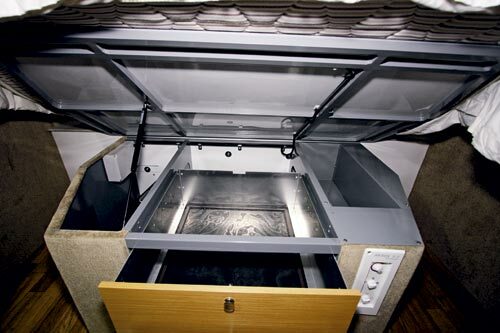 But, instead of a gas-fired cooktop, a Webasto diesel hot plate is used for catering and fridge/freezer functions are split with both a Isotherm 133L fridge and a 55L freezer drawer located under the bench. And, even with all that, there is still plenty of overhead locker, drawer and benchtop space. 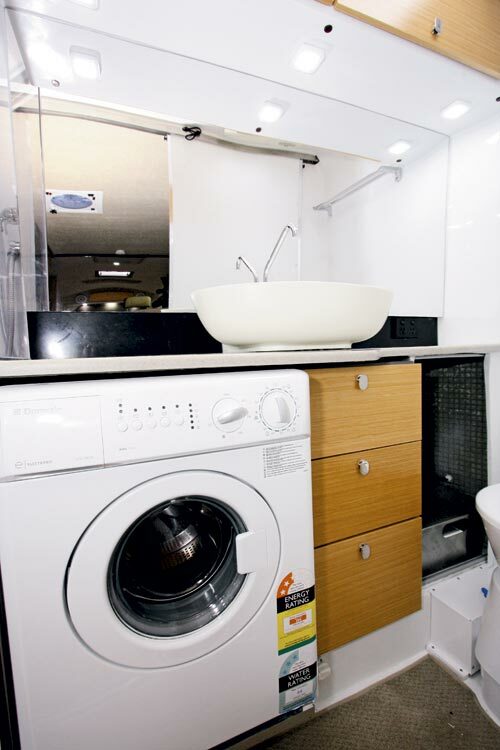 The bathroom has all the usual items such as a shower cubicle, vanity cabinet, Dometic cassette toilet and a washing machine, but it also has a purpose-built drying cabinet. 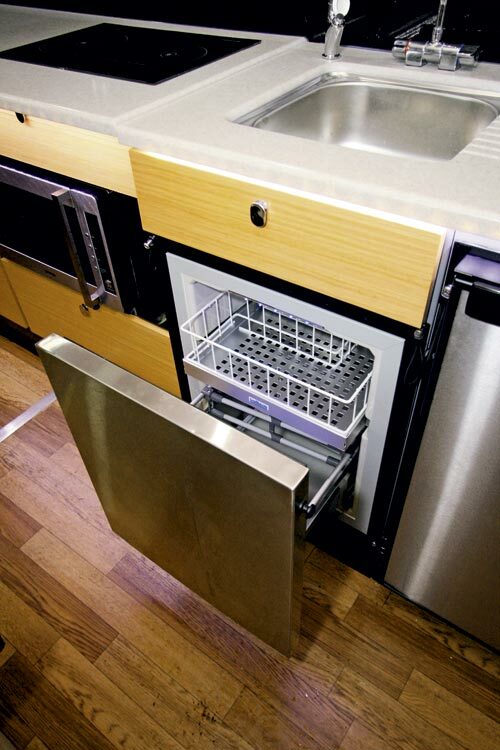 The diesel-fired heater can dry hanging clothes but it can also be used to warm up the bathroom on cold days. 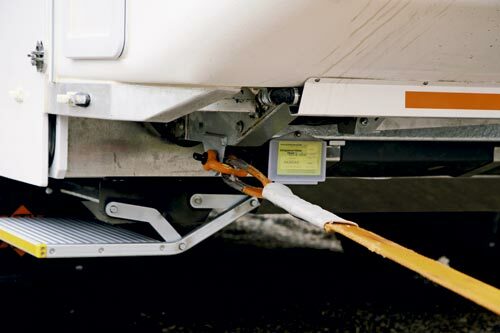 There is 480Ah worth of Lithium batteries in the Kruiser. This is, in part, to cope with the air-conditioner but also items such as the 1600W pure sine wave inverter. And not much of the roof can actually be seen as it’s covered in ultra-thin solar panels – all 540W of them. The Kruiser T3 comes with a good selection of electrical goodies. 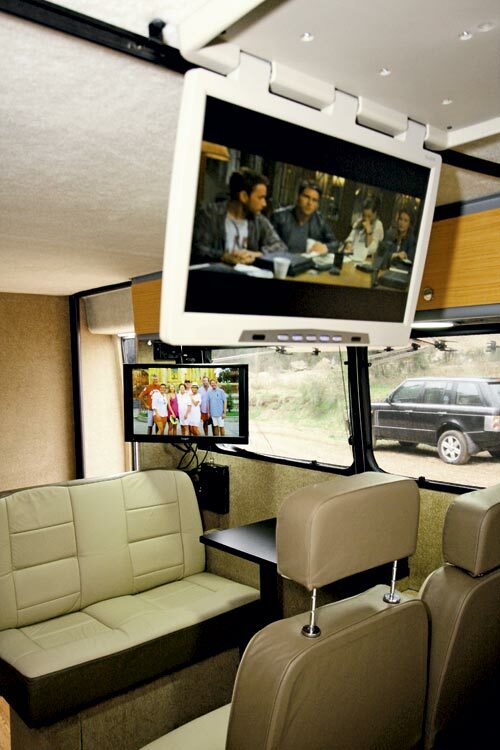 It has energy-efficient LED lighting, as well as a very sophisticated multi-media system with two drop down LCD TV screens (560mm/22in and 610mm/24in). Both can be seen from the bed but only one from the dinette. In addition there’s a Fusion radio with iPod socket and an antenna for giving extended range to the Telstra NextG network and a satellite. All the electrics, both inside and outside the caravan, can be controlled from an iPad, iPhone or Android device with the appropriate apps. There are two water tanks, one with a 200L capacity and one of 120L capacity. The larger one is designed be used for any water supply – town, dam or billabong, while the smaller one is restricted to drinking water only. At the rear, the 120L grey water tank has a separate pump and can be used to supply the toilet or washing machine. 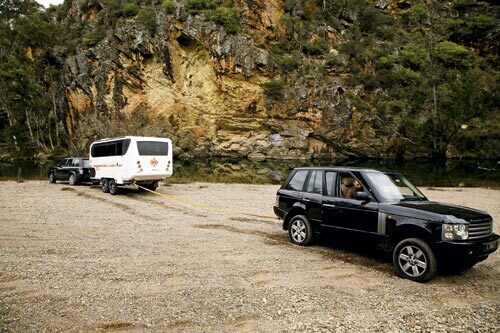 Despite its length of just over 7m (24ft) and its loaded weight of about 2600kg, the Kruiser T3 proved to be a very well-behaved tourer behind a Range Rover. Apart from the small matter of getting bogged, the van proved to be exceptionally manoeuvrable, both forwards and in reverse. The biggest surprise as far as the tow vehicle went was the relatively light ball weight, which proved to be no drama whatsoever. 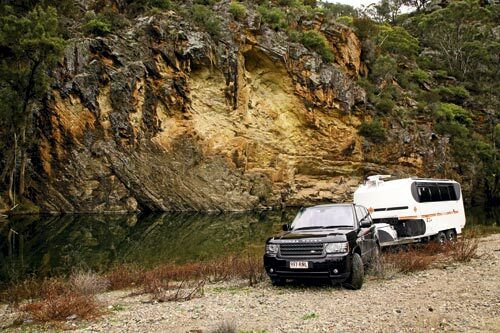 The Kimberley Kruiser Black Caviar T3 is a state-of-the-art RV from both offroad touring and technology points of view. But all of these features come at a price! 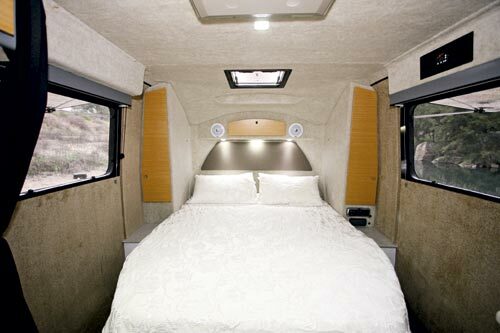 There’s no doubt that this van is built for a single purpose: to allow you to enjoy as much of the Australian continent as you’d like, in as much style and comfort as possible! 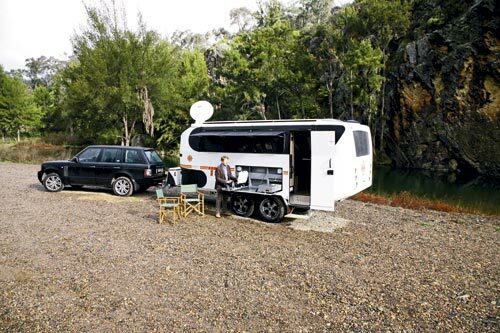 How about a Kimberley motorhome or fifth wheeler?